In accordance with Ministry of Education regulations, a student living more than 4.8 km from the school is entitled to free bus travel. However, students may have to make their own way up to 1.6 km to a pick-up point. Please click on the school bus route names above to view the bus pick-up times and locations. The school bus times stated on these routes are approximate only. The school buses stop along these routes at designated school bus stops only. Specific information on pick-up times and stopping points should be obtained from the bus company, Torlesse Travel Limited, on +64 3 3135453. For all new students who do not know where the school bus stops are located, for the first time only, you may stand outside anywhere along the route and you will be picked up. The bus driver will then inform you where to wait in the future. 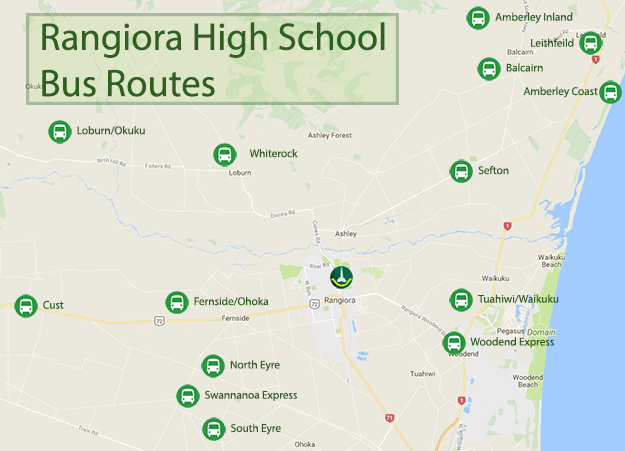 Please note that on Tuesday mornings all school buses run approximately 20 minutes later than these times as Rangiora High School does not open until 9.00am on Tuesday because all teaching staff are involved in Professional Learning activities. Good behaviour is expected on the bus at all times.